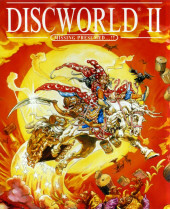 The development of Discworld II – subtitled Missing Presumed…?!? in the UK and Mortality Bytes in the US – was again headed by Australian game director Gregg Barnett, who had successfully convinced Discworld creator Terry Pratchett to sell the game rights to his fledgling company Perfect 10 Productions, which by then had been renamed to Perfect Entertainment. The author had always been wary of clueless moviemakers and game producers, but Gregg Barnett and his team understood his unique brand of humour and the first game turned out to be a surprising hit that was even well-loved by Pratchett’s biggest fans. A sequel was unavoidable and this time it was to be bigger, better, but still entirely Discworld. Like its predecessor, Discworld II didn’t come up with a fully original story, but instead made use of a combination of two different Discworld novels once again. 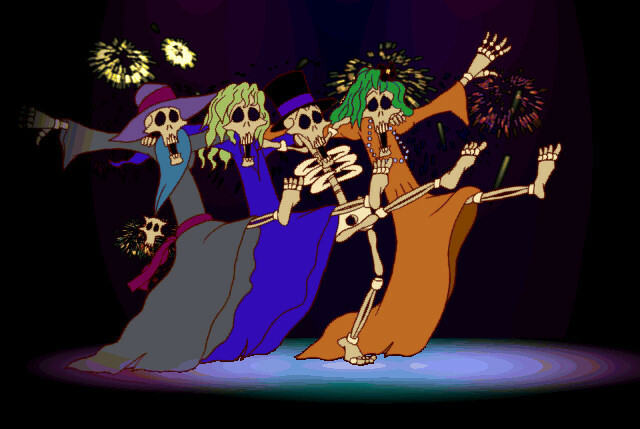 This time Gregg Barnett chose parts of Reaper Man and Moving Pictures for the story of Death going on an unplanned holiday and the movie industry emerging in the Discworld. The main protagonist was again the hapless wizard Rincewind, basically brought back by popular demand even though he was not part of the original stories. This time, the borrowed plots meshed together even better and the presence of Rincewind was also not entirely implausible since in both books the wizards of Unseen University play a big role. Of course, the game plot doesn’t follow the canon of the books at all, but Terry Pratchett had again given the game developers the freedom to mess with continuity all they wanted. This was not a bad idea, because Gregg Barnett had the knack of creating a slightly alternate Discworld universe while still staying true to the original. Characters and locations not only from the two source books but also from other stories pop up everywhere, making the second Discworld adventure even more fun. 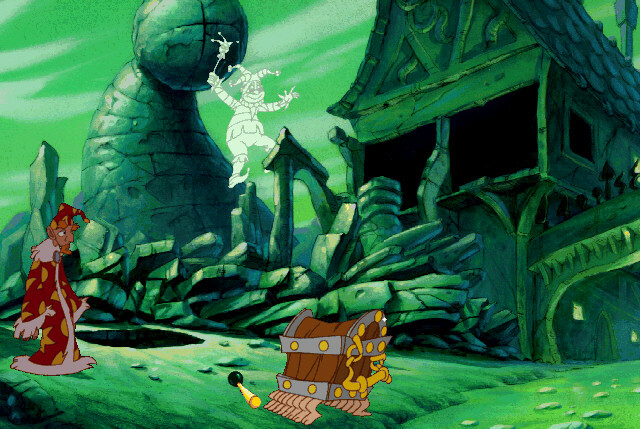 The involvement of a Monty Python member as the lead voice cast also gave the game a distinct python-esque slant, even recreating a famous scene from one of their movies. Barnett teaming up again with his old friend. Australian fantasy writer Paul Kidd also ensured that the game had lots and lots of witty dialogue true to Terry Pratchett’s own style. While the author himself declined to get involved too closely in the game development, he must have thrown the odd idea at Gregg Barnett and Paul Kidd because a lot of the dialogue sounds so inherently like himself that nobody else could have thought it up. One of the major problems of the first game were almost fixed in Discworld II: the overly complicated and sometimes nonsensical puzzles. Grett Barnett had obviously taken the criticism to heart and while most of the game is still a hunt for items quest, this time it does make a lot more sense and there are more hints liberally sprinkled throughout the game. Never mind that the game actually starts in exactly the same way its predecessor did and even admits that in one of the many instances of breaking the fourth wall – the first couple of puzzles are just to warm the story up and get the player through the motions. The puzzles of Discworld II are fun to accomplish and might only be frustrating for players who have never played a game like this before. Having some knowledge of Terry Pratchett’s books is a distinct advantage, but it’s not actually required – the game plays fine for the uninitiated, but works well as a starting point for the whole Discworld universe. The mid-1990s were a time when computer hardware got so good that game developers were finally able to abandon the sometimes restricting low resolution of 320×200 pixels and more than double it to 640×480 (actually slightly letteboxed to 432 pixels height) – LucasArts had missed the opportunity in 1995 with its epic space adventure The Dig because the game had been extraordinarily long in development, but Discworld II did not suffer the same fate. 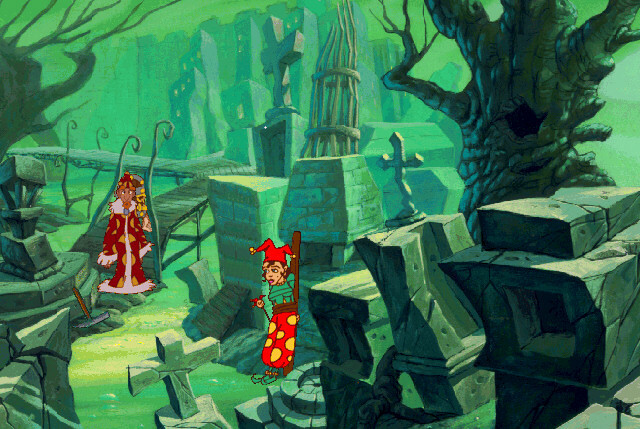 With the higher resolution came overhauled graphics that leaned even more towards being cartoonish than in the first game – it was not really the style of Pratchett’s cover artists and illustrators Josh Kirby or Paul Kidby, but it looked more like the animated series of Wyrd Sisters and Soul Music being produced by Cosgrove-Hall at the same time. 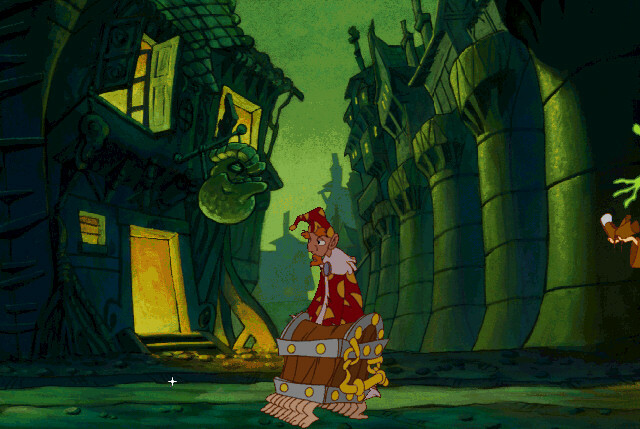 Discworld II didn’t just sport computer graphics, but almost full-blown traditional 2D animation, following in the footsteps of other adventures like Torin’s Passage, King’s Quest VII and, of course, Toonstruck. 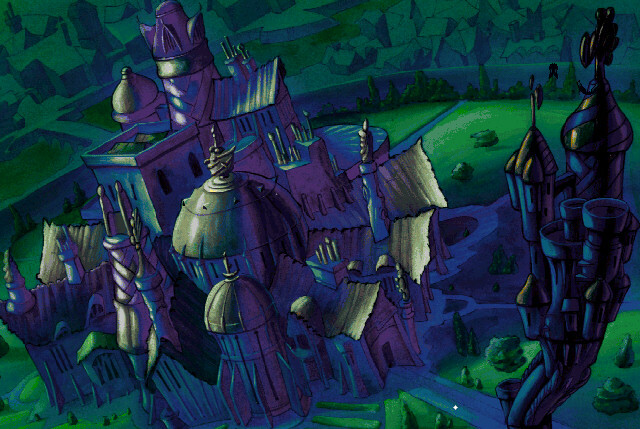 The backgrounds were once again hand-drawn too, bringing the Discworld to life in a resolution that was now less limited by pixels. There are real works of art to be seen, drawn in a half realistic and half cartoon style that had found its own distinctive look consistent through the whole game. Created again by the same team led by Paul Mitchell and Nick Pratt that already worked on the predecessor, the beautifully drawn and painted scenery is one of the main reasons to play the game, because there is so much to see. 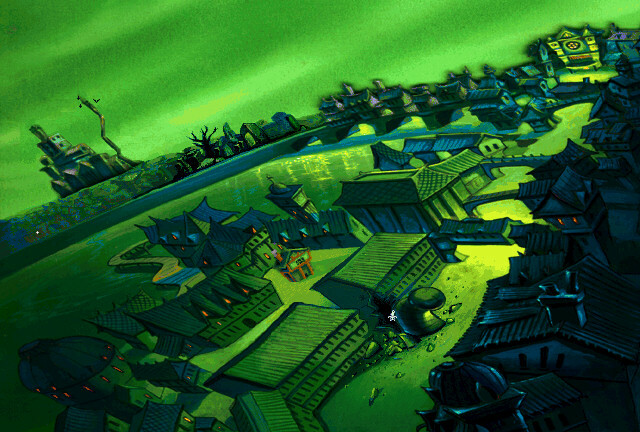 The amazing background graphics also hide a little bit the fact that the character designs basically work well, but sometimes seem almost too cartoonish for the scenery – in some places, it looks like a Hanna-Barbera short has been dropped into the game. 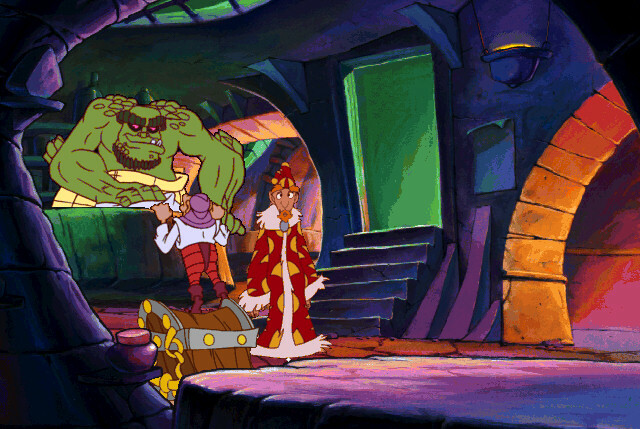 The style is radically different than in the predecessor and looks more like traditional cel-based animation than computer graphics – unfortunately, the animation still suffers from the same low frame rate as in the first game, making the graphics sometimes look like very basic stop motion. 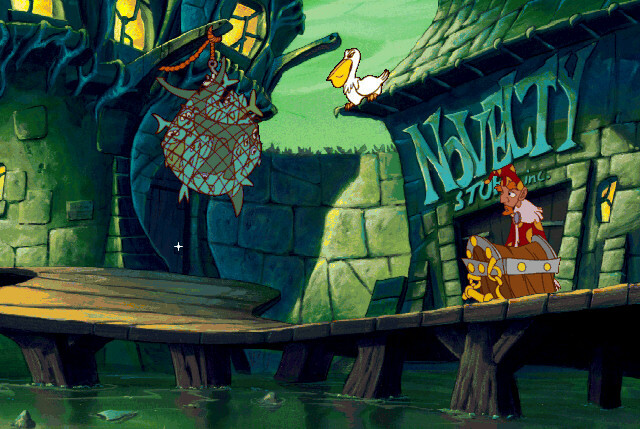 Discworld II also came with quite a lot of fully animated scenes that basically play like short films – if it wasn’t for the low frame rate. Especially the otherwise wonderful pre-credits and title sequence would have looked better even in 1996 with more in-between-frames – maybe it was a technical limitation or the budget was just not big enough for smoother animation. The surprising amount of ‘cut scenes’ was probably also the reason the game spanned two instead of just one CD, a bold and outrageous decision that not many other games had attempted at that time. Fortunately there was no excessive disc-swapping involved when the game wasn’t installed in its entirety on the harddrive. The biggest selling point of the first game had also not been abandoned – the excellent voice cast. 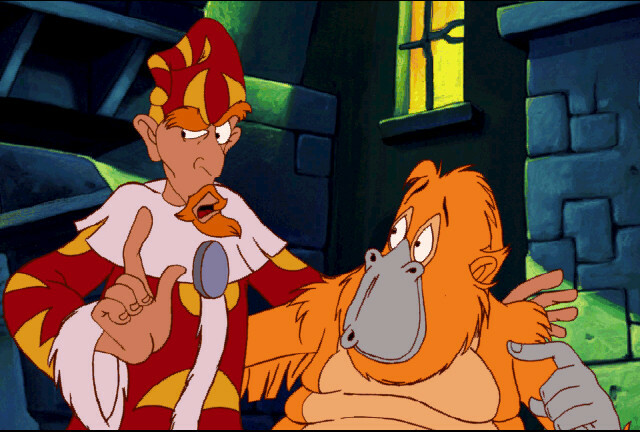 Eric idle, former Monty Python and one of the most amazing British comedians, again gave Rincewind its distinctive voice. This, of course, gave the game a distinct python-esque atmosphere – also thanks to the sharp and witty dialogue, to which Idle seems to have contributed quite a little bit himself. He’s the perfect embodiment of the failed, world-weary and sarcastic wizard and the game gives him plenty of occasions to comment on the plight of his character, breaking the fourth wall more than a couple of times. Eric Idle’s second participation in a Discworld adventure was not just simple celebrity casting, but a really fun addition to an already amazing game. 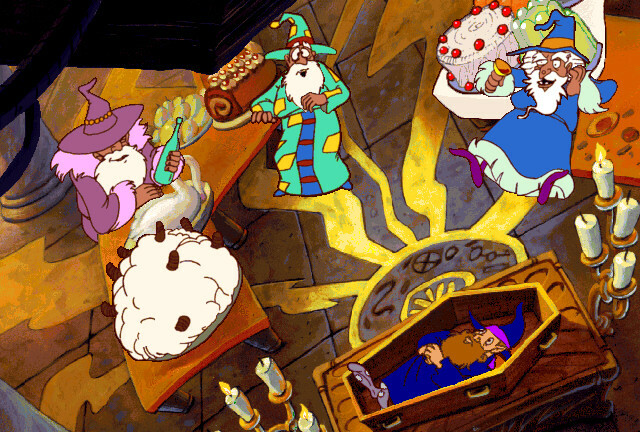 Unfortunately not all of the brilliant other voice actors were able to return for Discworld II, but Eric Idle still had a fantastic cast at his side. Former Doctor Who Jon Pertwee had sadly passed away in May 1996 and Tony Robinson was too busy with television projects to join the voice cast once again, although both Kate Robbins and Rob Brydon returned and also got the help of actor Nigel Planer. He had already been a fixed part of the Discworld universe as the narrator of the audiobooks and together with his two fellow cast members provided a multitude of amazing voices that literally sound like dozens of different people. They’re such a lot of fun to listen to that they are encouraging the player to go through all the dialogue options just to hear all the recorded voices. The music was also upgraded from the hit-and-miss playback of General MIDI to a fully digital soundtrack, which allowed british musician and composer Rob Lord to return to the Discworld in a much improved and more atmospheric way. Relying again on the proven mix of medieval-style tunes and comedic melodies, his Discworld II soundtrack now adds some more variety with a small selection of more creepy and darker sounds matching the mood of the seedier sides of Ankh-Morpork. But there are also a few funny tunes emulating more foreign atmospheres because this time the story literally goes overseas for a while. The only fault of the music is that most pieces loop too soon and are not really reacting to what’s happening on screen – it’s far away from the brilliant iMuse-driven soundtracks that LucasArts had been using since the early 90s. 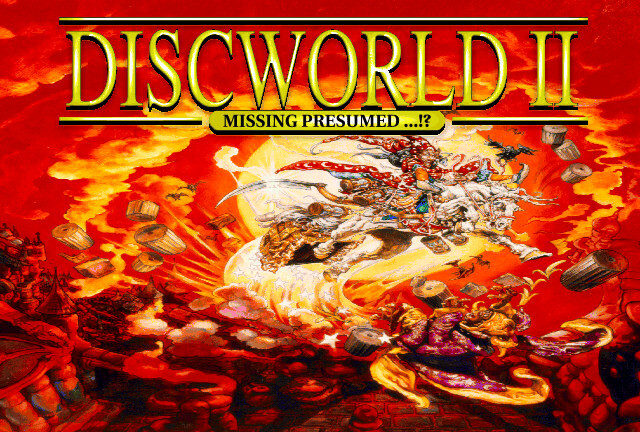 Despite some technical shortcomings, Discworld II has stood the test of time and over 20 years after its release, the game is still an enjoyable adventure classic and a very special treat for Terry Pratchett fans. It’s a fun and very quirky game that is considerably easier to play than its predecessor and while it didn’t become a huge seller back when it was released, the reviews were mostly positive. 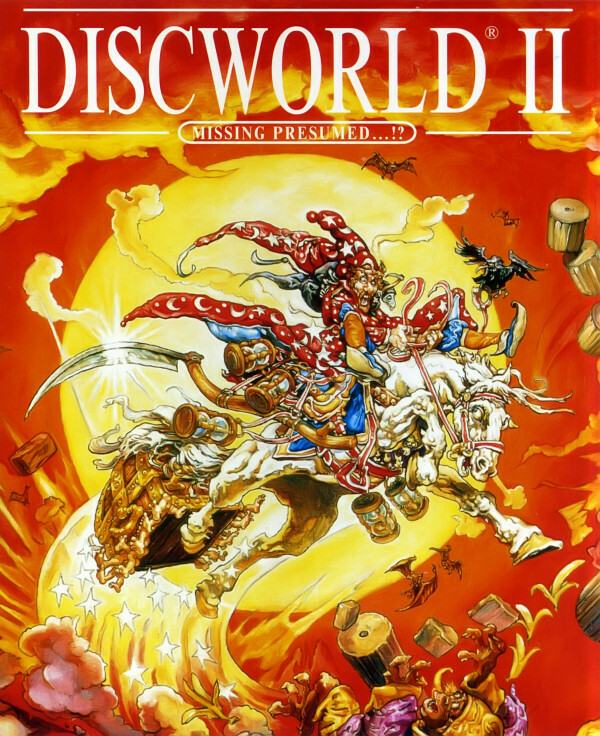 Discworld II almost became the last game of the series when development and company problems delayed the Discworld Noir until 1999 – unfortunately, the final installment could not quite achieve the same level as its predecessors, but it still turned out to be a solid and intrguing game. In the end, together with its predecessor, Discworld II still remains the best adventure game that Terry Pratchetts flat world has ever spawned – until today, almost two decades after the last game was released, no new attempts at a Discworld adventure has been made. 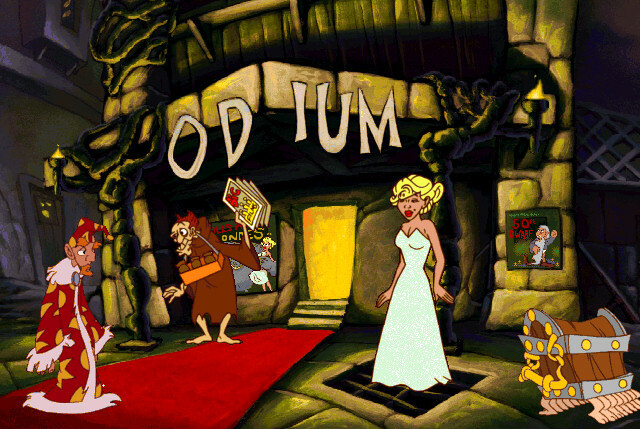 While Discworld I and II can be played easily on modern systems with the help of ScummVM, which has been supporting the games for quite a while, they are sadly only available second hand nowadays. The ScummVM team had been negotiating to make both games freeware, but complex legal situations and the fact that the company that made them doesn’t exist anymore has made this difficult and perhaps impossible. For the same reasons, the games have not yet been released on platforms like GOG.com, so the only way to play them is to get the original CD-ROM releases or look for an “unlicenesed” download possibility – the games are out there somewhere on the web if you look for them, but for obvious reasons I’m not able to include any links here. The screenshots were taken at the native 640×432 resolution with ScummVM, the coverart was scanned from my own box of a later UK budget release that had a slightly less shiny cover. 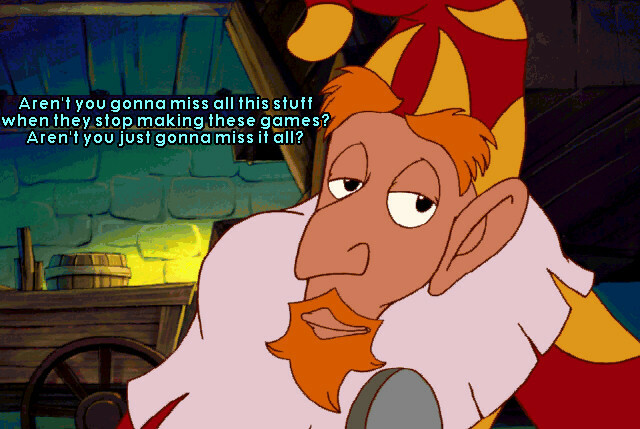 Rincewind does some foreshadowing in the intro.